The popular midsize sedan, the Toyota Camry, has always had a beautiful exterior design that people have been proud to show off and drive around in, but for the 2018 model, Toyota pulled out all the stops. The latest version of the Camry has strong features that bring the look of the vehicle from something that looks pleasant to something that will blow you away. 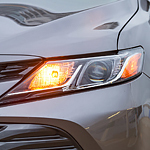 The Camry has a dual exhaust system with quad chrome tips that give the vehicle an ultra-sharp, sporty look. And don't forget about the wheels. The black machined-finish alloy wheels shine like jewelry for your wheels. If you want to see all of the updates on the Toyota Camry's exterior, come to DCH Wappingers Falls Toyota. One of our sales associates will be happy to show you around the vehicle, and then you can have a chat as you take a test drive.